One of me favourite past times is visiting the zoo. The Netherlands have a lot of zoos for such a small country. 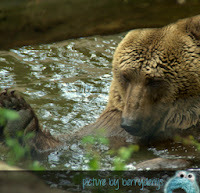 Every zoo has its own specialty, like Ouwehands Dierenpark in Rhenen. They are specialized in taking care of bears. The bears live in their own forest. They all came from different places, like circuses and from bear-dog-fights. Most bears are rescued from horrible places. But these bears are very happy now. Living their lives in peace. 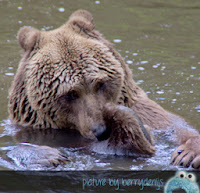 Like this bear, having fun in the water, cleaning his paws, minding his own business. Me loved to see that. Other bears were snoozing in the shade of a tree or eating carrots and lettuce, chasing of the two wolves who they share the forest with. It was really beautiful. 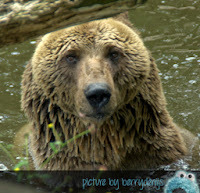 Me even got the chance to get really really close to the bears… Me was really in awe! Gotcha! 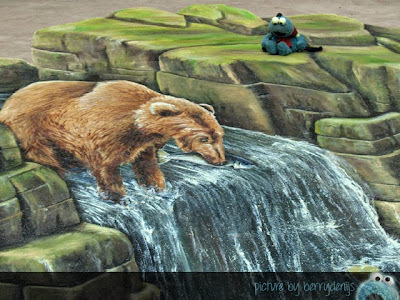 This is a 3D painting, the bears are not real, but they looked like it! Cool huh! 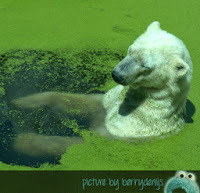 At Rhenen they have a family of polar bears. 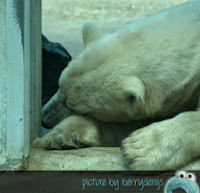 This is the male polar bear (you may recognize him from Friday’s Alphabet featuring the letter i. First he was sleeping on the rocks, next he was bathing and when me went back much later he was sleeping again. Must be nice to chill like that!